"Personas or personae are fictitious characters that are created to represent the different user types within a targeted demographic that might use a site or product. Personas are given characteristics and are assumed to be in particular environments based on known users’ requirements so that these elements can be taken into consideration when creating scenarios for conceptualizing a site. Cooper (1999) outlined the general characteristics and uses of personas for product design and development. In the context of software requirements gathering, a user persona is a representation of a real audience group. A persona description includes a user’s context, goals, pain points, and major questions that need answers. Personas are a common tool in Interaction Design (IxD)"
Personas often combine narratives and sometimes scenarios that often go into great detail to paint a plausible profile which looks at a person's motivations, goals, mindset, wants, needs, desires etc. And often times, personas are often cross-channel—taking a holistic look at the entire consumer experience. What I've been toying with is the idea of showing the persona ecosystem in a simplistic and visual format (shown above). This artifact would not replace a persona—on the contrary it should co-exist with one. 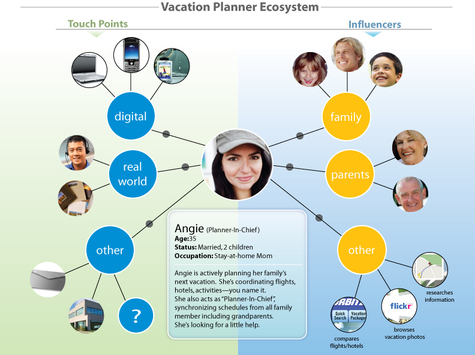 Where a persona can go deep, a persona ecosystem can go broad showing what is influencing the individual's behavior as well as what channels and touch points they may use. Tip of the hat to Julie Fleischer who helped inspire the "Planner-In-Chief" shown in this particular example. Happy to say that Julie is now working with Digitas Chicago.